More than two years ago I posted a story about safe practices with a woodstove. I said, “In addition to having a clean ‘exhaust system’ for your woodstove, it is a good idea to monitor the temperature of your stovepipe“. I clean the chimney in our log home myself. I have the flexible poles that screw together and the wire brush that attaches to the end. Having a metal chimney with round pipe, it is relatively easy to clean – but literally a ‘dirty job’ and my wife refuses to do it (imagine that). Anyway, at the end of last season’s annual chimney cleaning session, I made a mental note to remember to clean the flue sometime during mid season. I thought this would be a good idea due to the amount of creosote and ask that had formed in my pipes. If you have a straight chimney where the stack goes from the stove through the roof, you are less likely to build up as much creosote as you do when bends are part of the system. In my case, I have two 90 degree bends in the flue as pictured. This is not an optimal design as this tends to disturb and restrict the flow of air and thus builds up creosote much faster. Although it was only 9 degrees, this morning was the time I set aside to let the fire die down, the stove cool and tear into the stovepipe for a cleaning. Fortunately, this process doesn’t take long and we had a new fire in the box in less than an hour. What was remarkable was that from October through January, we already had almost 1″ of creosote build-up to brush out. Professionals I have spoken with tell me that this can be reduced by building a hot fire every morning and letting that help to clean the flue. I don’t know if this is true, but when you burn a stove 24×7 through the winter months you never have a cold stove in which to start a new ‘hot’ fire. I believe this build-up is a result of the 90 degree bends in my pipe. The interesting thing that struck me after relighting our first fire today was the difference in temperature being indicated on the stovepipe gauge. It seems that 1″ of creosote insulation was giving us a false sense of security. After the stove was hot and we had a ‘normal’ fire burning, the temp guage was showing the pipe to be much hotter than I’d seen in many months. If you monitor your stove’s temperature (and you should), a dirty flue will not be giving you a true reading on what’s going on in there. You could be burning fires too hot for safe practices and not even know it. If you have a setup like mine and use that stove often, you may want to consider a mid-season cleaning. PS: If you haven’t already seen it, check out my Ultimate Indoor Firewood Rack! 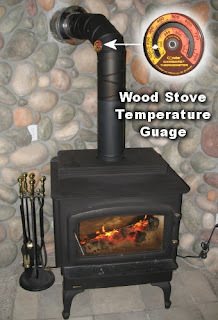 2 comments to Is your woodstove safe? In the current economic climate log cabins has become more than never a real cost effective alternative against renting an office, self-storage unit or even a bigger home in case the family has group up. That’s why at Cedexx Log Cabins (http://www.logcabinbuildings.co.uk)we’ve dedicated our time and efforts in finding a real solution to the current economical difficulties for small companies or self-employed people, also for the extra living space required by a new member in your family, playrooms, study rooms or workshop. At Cedexx Log Cabins, http://www.logcabinbuildings.co.uk, we’ve developed a wide range of small log cabins that can be used as a home office, study room, workshop, playroom, gym, sauna or even to accommodate unexpected guests, starting from 3×3 m (9.84×9.84 ft) up to 8×5 m (26.24×16.40 ft) our range of log cabins can be supplied in 28, 34 or 44 mm log thickness, along with roof shingles, wood protector, double glazed windows and doors and many more optional extras. Is no need to spend a fortune on renting an office when you can have a log cabin from as low as £1000 in the comfort of your own garden from where you can start working while you are keeping an eye on your kids. So why not to save a fortune (at least £3000-£4000/year) and work from your own home dedicating more time to your family and friends but also to your job? Many kids enjoy the ‘rustic’ charm of a log cabin and they can make a wonderful addition to their playground. Proper sitting, construction and maintenance of your log cabin can protect your investment and give you and your family many years of enjoyment. At Cedexx Log Cabins we have developed a wide range of mobile log homes dedicated to accommodate a small, medium or big family, with wall thicknesses starting from 90 mm (9 cm), double glazed windows and doors we can guarantee the complete satisfaction of our customers, with prices starting from as low as £9995 you can have a superb log home, for temporary or permanent living. It’s hard to believe that you won’t find something in our products range to suit your needs but anyway you should know that we also do bespoke log cabins, so even if is a small log cabin from 1×1 m or a large log home or log restaurant we can do it and unlike some of our competitors we won’t charge you extra for this. That is excellent advice. We have a similar setup with our stove and the idea of a mid season cleaning never dawned on me. Thanks.